Our programs connect people with dogs for life-saving and life-changing results. Our Youth-Canine Programs engage kids who may not learn best by traditional teaching methods or who may not have experienced an unconditional, loving relationship in their lives. 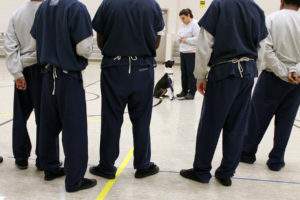 Through hands-on dog training, the youth form a connection with the dogs they are training. Kids start showing up to school (“I never looked forward to Mondays before!”), and their grades improve. These positive training methods help the youth gain confidence and learn life skills, including anger management, job readiness, positive parenting and leadership skills. The dogs in these programs are from local shelters. The basic obedience skills they learn in our programs makes them more adoptable. It’s a win-win for both the youth and the dogs. Through our Pet Therapy Programs we provide trained, registered teams for visitation in senior communities, hospitals, hospice care facilities, and support groups. Paws & Think teams also provide therapeutic work with children to improve literacy, cope with loss, and reach physical and occupational rehabilitation goals. We provide classes and outreach programs regarding the value of the relationship between people and their pets, responsible pet ownership and bite prevention.